The instrument panel layout is...fine. The red and black color scheme is stylish, and toggling through various information was nice but doesn’t really add to the driving experience. Separation of the tachometer from the speedometer by the display sort of takes away from the point of clustering gauges, but then my humble Honda Accord LX is a true manual, not a manumatic. Perhaps if I had driven the higher end model or a newer Charger with GPS directions displayed, I would have been more pleased with the layout. Regardless, I’d rather see a heads up display, but I know that’s asking a bit much.While I wasn’t ecstatic about the instrument panel layout, I didn’t dislike it either. The presence of the touchscreen was nice, but the general layout is not particularly well thought out. 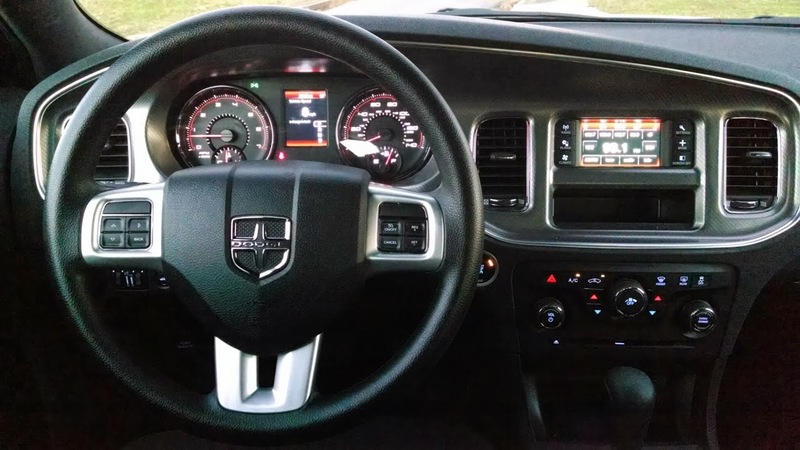 If Dodge had made the touch screen display larger, left out the unnecessary control knobs, and combined the awkward cubbyhole/slots into one useful storage space, the dash would have been much more user friendly and organized. 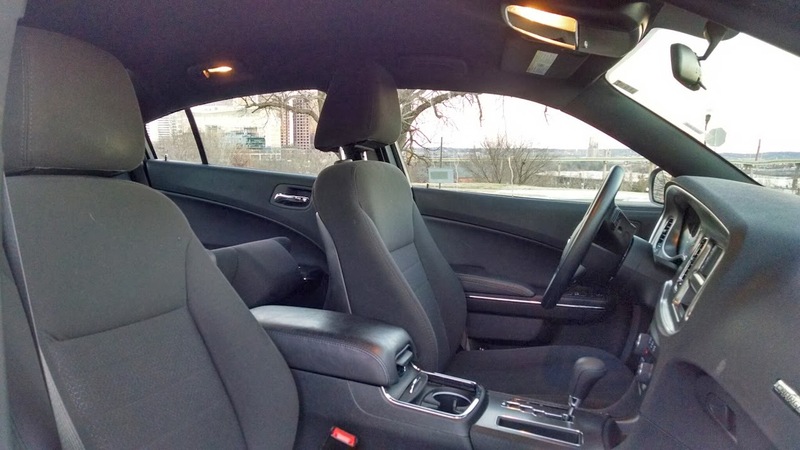 Just behind the two cupholders sits a roomy center console. This width was much appreciated for the longer drives with passengers, as elbow room was less of an issue. Opening the compartment, there’s a removable tray for small items and coins, but the tray, which looks cheap and poorly made, takes up just enough space to make reaching in for the car charger or USB troublesome. Initially the USB was a welcome sight, until realizing that Dodge, like so many other manufacturers, is an Apple lover, so the firmware doesn’t play well with others, such as my Motorola Moto X. This completely takes away from the point of the feature. 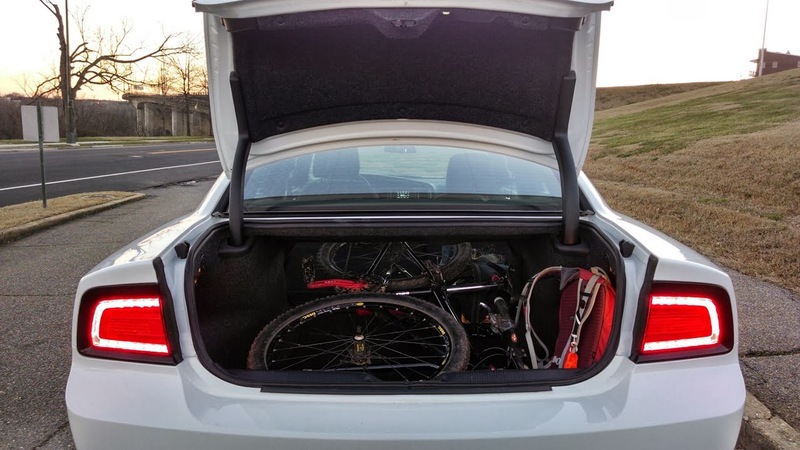 As a mountain biker, if the vehicle doesn’t have a bike rack, the trunk needs to be able to hold my bike and all the goodies that go with a good ride. With both seats down, I was easily able to slip my rig in sans front wheel with plenty of room for everything else. My one complaint is the center seat belt doesn’t detach; this can make piling up the car a bit tricky. When you need to pass that person who is slowing down for invisible traffic, the giddy-up easily moves you right past the annoying miscreant to open road. The engine definitely comes to life with a heavy foot but is smooth and quiet when not owning the road. Even on an aggressive hill, the multi-displacement system doesn’t shortchange the power you need for climbing. For the more engine attentive driver, there are various engine delays when shutting off the engine. Even when downshifting, the manumatic was smooth. There’s a fair amount of gain before the car decides it’s a better driver than you and shifts for you. This is a breath of fresh air compared to my previous experiences of other manufacturers tooting about their jerky, smarter-than-thou manumatic. Traction control gripped the roads well on the slick, pond riddled roads of rainy Richmond. Brakes were responsive to the sudden appearance of seemingly invincible college students. Sharp turns with peel outs didn’t seem to create much drama, but then I didn’t really get to autocross - a shame, I know. Despite the size of the Charger, u-turns in Richmond, which are few, far between, and tight, were not much of a problem. 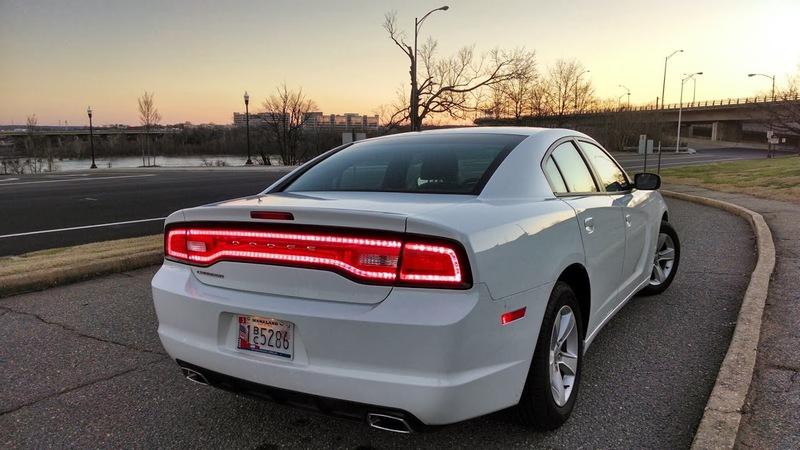 The Charger is primarily focused on driver satisfaction. 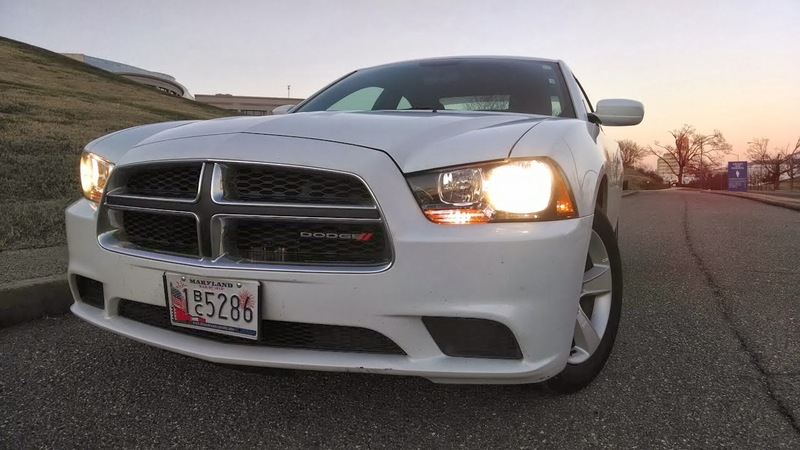 It accelerates aggressively, corners well, and cruises comfortably. Passenger space is good but not phenomenal. Trunk and back seat convertibility allow for easy and ample storage. Would I want this in my garage? Absolutely.